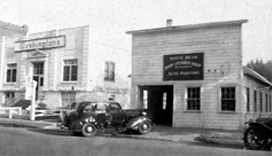 2222 Fourth Street (the home of Kellerman’s Event Center) has an eclectic history, giving it the character that it has today. 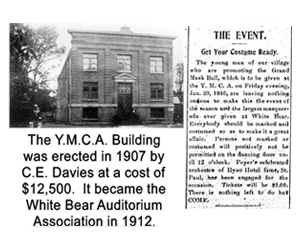 The space has now gone back to its roots as an event center, as it was in 1912 as the White Bear Auditorium. Terry Kellerman opened AC Upholstery in 1979, which was on the lower level of the building until 2016. After many years of renting the space, Terry and wife Anne eventually had an opportunity to buy the building. Since then, they have been making renovations to the entire building slowly, but surely. In 2011, the Kellerman’s began dreaming up what the space would look like as an event center, if given the right touch. After countless hours of work, the Kellermans resurrected the ballroom’s interior, highlighting the historic architectural features with wood and brick. Terry built European-style-store-fronts along one wall to add an old-world street scenes look. Terry used a variety of remnants that he found in the building’s attack: pulleys, belts and shafts, likely from its days as a woolen mill, and incorporated those into the building’s decor. The space was revitalized and became what today is Kellerman’s Event Center.